Zoom into action with the Millennium Falcon Microfighter. This LEGO Star Wars toy features lots of authentic detailing, 2 stud shooters and space to seat the included Chewbacca minifigure with his bowcaster. - Includes a Chewbacca minifigure. - Features lots of authentic details, 2 stud shooters and a seat on top for a minifigure to sit. - Also includes Chewbacca's bowcaster. 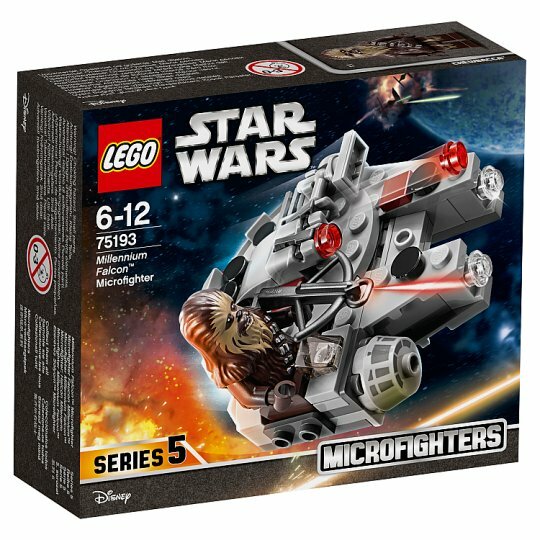 - Intercept the 75194 First Order TIE Fighter Microfighter for even more exciting space battles! - This LEGO Star Wars toy is suitable for ages 6-12. - Measures over 1” (4cm) high, 3” (8cm) long and 3” (8cm) wide.